This week, I’m joining the Display Stampers Blog Hop, sharing some of my creations that I made for the OnStage Displays in Salt Lake City. You’re probably wondering…what exactly is a Display Stamper? Well, it is a person that is selected by Stampin Up’s Art Department to make the projects that will be up on display at their OnStage Event. It is a huge honor to be selected as we are making the first artwork that our fellow Demonstrators will get to see using brand new products. I was one of fourteen Demonstrator’s that was selected for Salt Lake City’s event. It means so much to me to be selected. For this Blog Hop, we also have Demonstrators from Europe and the South Pacific that were also selected to be Display Stampers in their Region. Today I’m sharing one of my scrapbook pages that I made of my daughter. She is such a willing model and has a great time taking pictures with her friends. I used the brand new Beautiful Day stamp set. Both the flower and the butterfly are huge images, which can be challenging some times. I used the flower to make my own background paper. Then I layered a piece of vellum over the top to soften the background. The mini sequins are glued down using the fine-tip glue pen. I also used a bit of the brand new Silver Baker’s Twine wrapped around the photo. I really lucked out with the products that I got to work with. Butterflies and flowers are right up my alley. And a brand new product to work with as well? Oh my goodness, Brusho is my new favorite way to color. I think I tried about five or six different techniques with the Brusho, but this is definitely one of my favorite results. Brusho is a brand new product that will be available in the Occasions Catalog starting January 3rd. Brusho is watercolor ink crystals and they are super vibrant after wetting them. To get both the mottled and the sparkly solid coloring, I used two different techniques on this butterfly. First I stamped the butterfly on white card stock. Then I sprinkled the Prussian Blue Brusho onto the butterfly. Spritz with water. The more you spritz, the richer the color. The final step for the solid sections of the wing is to use a Clear Wink of Stella pen. The Wink of Stella evens out the color and provides a beautiful sparkle to it as well. It’s sort of like watercoloring with an aqua painter but far more sparkly. It’s really tough to see all the sparkle in the picture, but it is there. I promise you! My number one item from the Occasions Catalog is the Brusho. If you like to color, it is definitely a must buy. I hope you enjoyed this first project today. The Display Stamper Blog Hop will be going on all week. Check back daily for new projects. To Hop to the next page, click the Next link here and it will take you to Katharina Baranski’s page. Or you can check out any of the pages by clicking on the name below. As Thanksgiving quickly approaches, there is one more thing to be thankful for… That’s right, a Stampin Up sale! For the first 24 hours, Stampin Up will have a number of stamp sets on sale at really great prices. 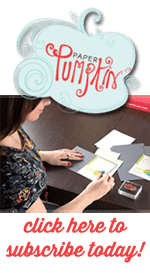 Tuesday through Sunday, Stampin Up is adding some of my favorite framelits and dies to the sale. And we’ll close out Cyber Monday with a bang. Check back later for those deals. A brand new product?!? Say what?!? Yes, the Stampin Blends markers are available to purchase starting November 1st. The Stampin Blends markers are alcohol based markers and they help you create beautiful coloring with shading. Check out the Orchid in this picture. It is stunning. You really get the depth of the flower with the lighter and darker areas. With a little bit of practice, you’ll have these markers mastered in no time. WOW! Great page to showcase those large images from this set. I’m excited for Brusho but would have been really intimidated to be one of the first to use it. You did a fabulous job. Thanks Charlet! You are going to love Brusho. It’s amazing. Such a beautiful layout Diane. I can’t wait to get my hands on the Brushos! 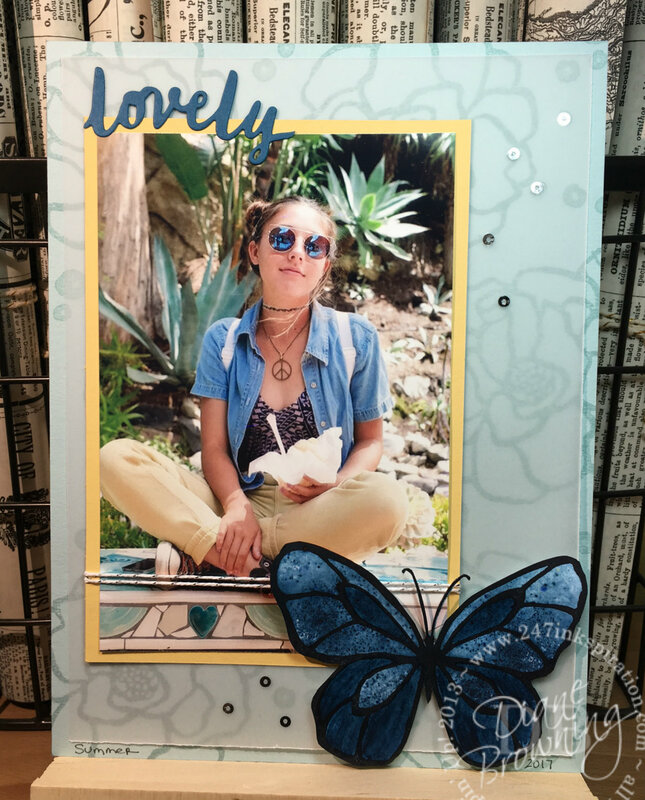 I love the background you created – looks fab with the vellum overlay.